WHAT IS A FLEXSTONE SURFACE? Flexstone Coatings > WHAT IS A FLEXSTONE SURFACE? Flexstone is a thick, rubberized, eco-friendly cold applied coating designed for applications on sundecks, flat roofs, and more. It is versatile, long-lasting, and resistant to freezing temperatures and heavy traffic. The finish coats are also 100% UV stable and fade resistant. Flexstone is fully approved for use over living space (ie. flat roofs and decks) in all of Canada by CCMC (Canadian Construction Materials Center). 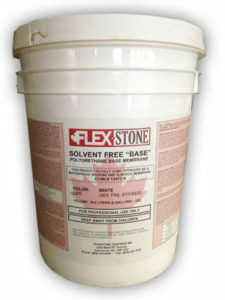 Flexstone has undergone and passed all the same tests as Torch-on SBS roofing. Flexstone base is a premium water-catalyzed urethane (WCU) designed for a wide array of waterproofing applications. The base coat is comprised of a thick white trowel applied base coat that is mixed with water and spread evenly over a surface. The base coat is generally applied at a thickness of approximately 1/8″ to 1/16″, around 3 times more than other coatings! It then cures to a firm but flexible and rubbery finish that can withstand extreme heat, extreme cold, and retains it’s flexibility for the lifespan of the surface it adheres to. The Flexstone base is applicable over almost any surface and maintains a tremendous bond with the substrate for decades. These surfaces include new plywood, concrete, torch-on roofing, vinyl decking, metal, and fiberglass (use Flexstone primer for torch-on, concrete, and pressure treated plywood applications). The base coat is the most important component of the Flexstone systems. It provides the necessary flexibility, durability, and waterproofing properties necessary for all Canadian climates. Flexstone top coat systems are required over top of the base to create a great looking appearance, provide UV stability, and provide extra protection from foot and/or vehicular traffic. There are two top-coat options available for Flexstone customers: Standard Colour Coat Finish and the famous Textured Stone Finish. The standard colour coat system requires only one additional component atop of the base coat, an aliphatic (UV stable and fade resistant) urethane top-coat. The top coat is simply rolled out over the base while simultaneously back-rolling fine silica sand for slip resistance. This finish type is ideal for industrial flooring, roof decks, and walkways. The textured stone finish requires a few extra steps but the end result is a beautiful speckled appearance that mimics aggregate. The appearance is achieved by rolling out an aromatic top coat (not UV stable, but less expensive than the aliphatic) over the base. While the top coat is still sticky, the applicator will broadcast (by hand or hopper-gun) our Flexstone blended acrylic flakes into the surface to rejection. The following day, the excess chips are swept up and the surface is sanded to the desired coarseness. Once your desired coarseness is achieved, our one part urethane clear coat is rolled atop to provide a protective and flexible glossy layer to top off the most attractive liquid applied finish on the market.